Big & Rich topped the chart for the first time in 2007. Hot Country Songs is a chart that ranks the top-performing country music songs in the United States, published by Billboard magazine. In 2007, 25 different songs topped the chart in 52 issues of the magazine, based on weekly airplay data from country music radio stations compiled by Nielsen Broadcast Data Systems. In the first issue of the new year, Brad Paisley reached number one with "She's Everything", replacing "Want To" by Sugarland, which had been number one in the issue dated December 30, 2006. This was the first of three number ones for Paisley in 2007, a feat only matched by Kenny Chesney. Paisley, however, spent significantly less time at number one in 2007, occupying the top spot for five weeks compared to Chesney's twelve. 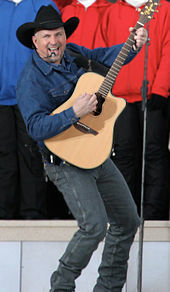 Chesney's song "Never Wanted Nothing More" was the longest-running number one of the year, with five weeks at the top. Acts who achieved their first number ones in 2007 included Canadian band Emerson Drive, whose song "Moments", which topped the chart in June, was the first ever Hot Country Songs number one by a band from Canada. Big & Rich also reached number one for the first and only time, topping the chart with the wedding ballad "Lost in This Moment" in July. In September, Garth Brooks made history when "More Than a Memory", the first single from his boxed set The Ultimate Hits, became the first song in the 63-year history of Billboard's country music charts to enter at number one. Another record was set in June when Tracy Lawrence topped the chart with his song "Find Out Who Your Friends Are". Reaching number one in its 41st week on the chart, the song set a new record for the slowest climb to the top of the Hot Country Songs chart. The final number one of the year was Taylor Swift's "Our Song", which also achieved a chart milestone. With the song, which she had originally written for a high school talent show, 18-year old Swift became the youngest sole writer and singer of a number one country song. Garth Brooks entered the chart at number one with "More Than a Memory", the first time a song had ever debuted in the top spot of the Hot Country Songs chart. Rodney Atkins topped the chart twice in 2007. At the end of the year Taylor Swift achieved her first number one. "Love Me If You Can"
^ McKinley, Jr., James C. (October 26, 2012). "Changes to Charts by Billboard Draw Fire". The New York Times. Archived from the original on November 3, 2012. Retrieved May 24, 2013. ^ "Hot Country Songs chart for December 30, 2006". Billboard. Retrieved August 22, 2010. ^ Punch, Daniel (July 6, 2012). "Emerson Drive still evolving as band". Sarnia Observer. Archived from the original on April 8, 2018. Retrieved April 7, 2018. ^ Morris, Edward (July 26, 2007). "Big & Rich Toast Their First No. 1 Single". CMT. Archived from the original on October 23, 2017. Retrieved October 22, 2017. ^ Shelburne, Craig (June 8, 2007). "Emerson Drive Collects First No. 1 Hit, "Moments"". CMT. Archived from the original on October 23, 2017. Retrieved October 22, 2017. ^ Morris, Edward (September 7, 2007). "Garth Brooks Sets Record With No. 1 Song". CMT. Archived from the original on April 7, 2018. Retrieved April 7, 2018. ^ Cohen, Jonathan (June 15, 2007). "Rihanna's Hot 100 hat trick with 'Umbrella'". The Hollywood Reporter. Archived from the original on October 23, 2017. Retrieved October 22, 2017. ^ Shelburne, Craig (April 15, 2008). "Taylor Swift Shares Story and Success of Award-Winning "Our Song"". CMT. Archived from the original on July 29, 2014. Retrieved October 22, 2017. ^ "Taylor Swift". NME. Archived from the original on October 16, 2017. Retrieved October 22, 2017. ^ "Hot Country Songs chart for January 6, 2007". Billboard. Archived from the original on March 13, 2017. Retrieved August 22, 2010. ^ "Hot Country Songs chart for January 13, 2007". Billboard. Archived from the original on March 13, 2017. Retrieved August 22, 2010. ^ "Hot Country Songs chart for January 20, 2007". Billboard. Archived from the original on March 13, 2017. Retrieved August 22, 2010. ^ "Hot Country Songs chart for January 27, 2007". Billboard. Archived from the original on October 29, 2015. Retrieved August 22, 2010. ^ "Hot Country Songs chart for February 3, 2007". Billboard. Archived from the original on November 29, 2015. Retrieved August 22, 2010. ^ "Hot Country Songs chart for February 10, 2007". Billboard. Archived from the original on March 13, 2017. Retrieved August 22, 2010. ^ "Hot Country Songs chart for February 17, 2007". Billboard. Archived from the original on March 13, 2017. Retrieved August 22, 2010. ^ "Hot Country Songs chart for February 24, 2007". Billboard. Archived from the original on April 17, 2016. Retrieved August 22, 2010. ^ "Hot Country Songs chart for March 3, 2007". Billboard. Archived from the original on November 7, 2016. Retrieved August 22, 2010. ^ "Hot Country Songs chart for March 10, 2007". Billboard. Archived from the original on March 13, 2017. Retrieved August 22, 2010. ^ "Hot Country Songs chart for March 17, 2007". Billboard. Archived from the original on March 13, 2017. Retrieved August 22, 2010. ^ "Hot Country Songs chart for March 24, 2007". Billboard. Archived from the original on March 13, 2017. Retrieved August 22, 2010. ^ "Hot Country Songs chart for March 31, 2007". Billboard. Archived from the original on March 13, 2017. Retrieved August 22, 2010. ^ "Hot Country Songs chart for April 7, 2007". Billboard. Archived from the original on March 13, 2017. Retrieved August 22, 2010. ^ "Hot Country Songs chart for April 14, 2007". Billboard. Archived from the original on November 7, 2016. Retrieved August 22, 2010. ^ "Hot Country Songs chart for April 21, 2007". Billboard. Archived from the original on March 13, 2017. Retrieved August 22, 2010. ^ "Hot Country Songs chart for April 28, 2007". Billboard. Archived from the original on March 13, 2017. Retrieved August 22, 2010. ^ "Hot Country Songs chart for May 5, 2007". Billboard. Archived from the original on March 13, 2017. Retrieved August 22, 2010. ^ "Hot Country Songs chart for May 12, 2007". Billboard. Archived from the original on March 10, 2017. Retrieved August 22, 2010. ^ "Hot Country Songs chart for May 19, 2007". Billboard. Archived from the original on May 3, 2016. Retrieved August 22, 2010. ^ "Hot Country Songs chart for May 26, 2007". Billboard. Archived from the original on March 13, 2017. Retrieved August 22, 2010. ^ "Hot Country Songs chart for June 2, 2007". Billboard. Archived from the original on February 5, 2016. Retrieved August 22, 2010. ^ "Hot Country Songs chart for June 9, 2007". Billboard. Archived from the original on April 16, 2016. Retrieved August 22, 2010. ^ "Hot Country Songs chart for June 16, 2007". Billboard. Archived from the original on March 13, 2017. Retrieved August 22, 2010. ^ "Hot Country Songs chart for June 23, 2007". Billboard. Archived from the original on November 7, 2016. Retrieved August 22, 2010. ^ "Hot Country Songs chart for June 30, 2007". Billboard. Archived from the original on March 13, 2017. Retrieved August 22, 2010. ^ "Hot Country Songs chart for July 7, 2007". Billboard. Archived from the original on March 13, 2017. Retrieved August 22, 2010. ^ "Hot Country Songs chart for July 14, 2007". Billboard. Archived from the original on October 29, 2015. Retrieved August 22, 2010. ^ "Hot Country Songs chart for July 21, 2007". Billboard. Archived from the original on March 13, 2017. Retrieved August 22, 2010. ^ "Hot Country Songs chart for July 28, 2007". Billboard. Archived from the original on March 13, 2017. Retrieved August 22, 2010. ^ "Hot Country Songs chart for August 4, 2007". Billboard. Archived from the original on March 13, 2017. Retrieved August 22, 2010. ^ "Hot Country Songs chart for August 11, 2007". Billboard. Archived from the original on August 15, 2015. Retrieved August 22, 2010. ^ "Hot Country Songs chart for August 18, 2007". Billboard. Archived from the original on January 19, 2016. Retrieved August 22, 2010. ^ "Hot Country Songs chart for August 25, 2007". Billboard. Archived from the original on December 13, 2015. Retrieved August 22, 2010. ^ "Hot Country Songs chart for September 1, 2007". Billboard. Archived from the original on March 13, 2017. Retrieved August 22, 2010. ^ "Hot Country Songs chart for September 8, 2007". Billboard. Archived from the original on July 19, 2015. Retrieved August 22, 2010. ^ "Hot Country Songs chart for September 15, 2007". Billboard. Archived from the original on March 13, 2017. Retrieved August 22, 2010. ^ "Hot Country Songs chart for September 22, 2007". Billboard. Archived from the original on March 10, 2017. Retrieved August 22, 2010. ^ "Hot Country Songs chart for September 29, 2007". Billboard. Archived from the original on November 7, 2016. Retrieved August 22, 2010. ^ "Hot Country Songs chart for October 6, 2007". Billboard. Archived from the original on March 13, 2017. Retrieved August 22, 2010. ^ "Hot Country Songs chart for October 13, 2007". Billboard. Archived from the original on March 13, 2017. Retrieved August 22, 2010. ^ "Hot Country Songs chart for October 20, 2007". Billboard. Archived from the original on March 13, 2017. Retrieved August 22, 2010. ^ "Hot Country Songs chart for October 27, 2007". Billboard. Archived from the original on March 13, 2017. Retrieved August 22, 2010. ^ "Hot Country Songs chart for November 3, 2007". Billboard. Archived from the original on January 16, 2016. Retrieved August 22, 2010. ^ "Hot Country Songs chart for November 10, 2007". Billboard. Archived from the original on July 5, 2015. Retrieved August 22, 2010. ^ "Hot Country Songs chart for November 17, 2007". Billboard. Archived from the original on March 13, 2017. Retrieved August 22, 2010. ^ "Hot Country Songs chart for November 24, 2007". Billboard. Archived from the original on March 13, 2017. Retrieved August 22, 2010. ^ "Hot Country Songs chart for December 1, 2007". Billboard. Archived from the original on November 7, 2016. Retrieved August 22, 2010. ^ "Hot Country Songs chart for December 8, 2007". Billboard. Archived from the original on November 7, 2016. Retrieved August 22, 2010. ^ "Hot Country Songs chart for December 15, 2007". Billboard. Archived from the original on March 13, 2017. Retrieved August 22, 2010. ^ "Hot Country Songs chart for December 22, 2007". Billboard. Archived from the original on March 13, 2017. Retrieved August 22, 2010. ^ "Hot Country Songs chart for December 29, 2007". Billboard. Archived from the original on March 13, 2017. Retrieved August 22, 2010.